Jake grew up in northwest Montana. After graduating high school from Bigfork and attending college in Arizona he returned to Montana with a degree in Computer Information Systems and a renewed desire to explore the amazing country he grew up in. He began exploring the Bob Marshall Wilderness complex and Glacier National Park. In 2010, he walked away from his corporate job as an IT professional to pursue film and video production. Soon a project developed which became ‘Hike 734’ – hike all 734 miles of trail in Glacier National Park in one year and film his journey. 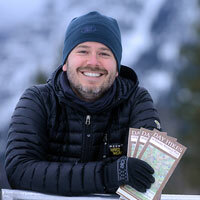 Jake is an engaging speaker and thoroughly enjoys sharing his hiking experiences.